Marketers are facing a more fragmented landscape than ever before and sometimes an intelligent link, no matter how intricate you set the rules isn’t enough. In these situations, a carefully curated list of options can improve the shopper’s buying experience, improve your conversions and revenue as well as ensure compliance. It’s situations like the ones below where Choice Pages really shine. Learn more about Choice Pages in our latest blog post or read on to dig into a handful of the top use cases for Choice Pages. Buy the album on iTunes or maybe Amazon? Stream the track on Apple Music or Spotify? Watch the music video on YouTube? Maybe better to buy merch from the artist’s Bandcamp site? Or maybe grab tickets to their show? Promoting music isn’t nearly as black and white as it was 10 years ago where a globalized iTunes link was enough to nearly guarantee success. Even a well built Advanced Targeting link that not only localizes but sends Android users to Google Play, Kindle users to Amazon and everyone else to Apple Music often isn’t the silver bullet. Consuming music is a more fragmented experience now than it’s ever been with no clear winners. 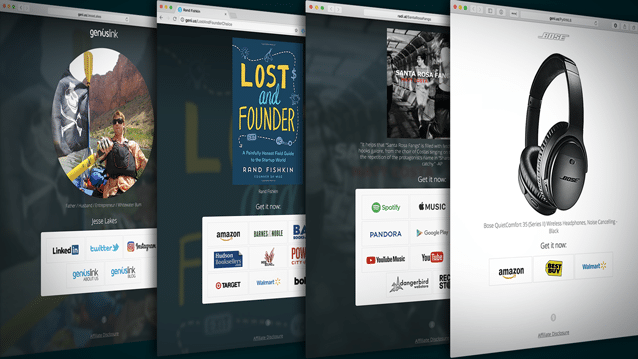 Music marketers are hedging their bets and providing a better experience for fans with Choice Pages that include a curated list of the best ways to enjoy, or remember, any given song or album whether it’s digital or physical, in the past (merch) or in the future (tickets to a show). 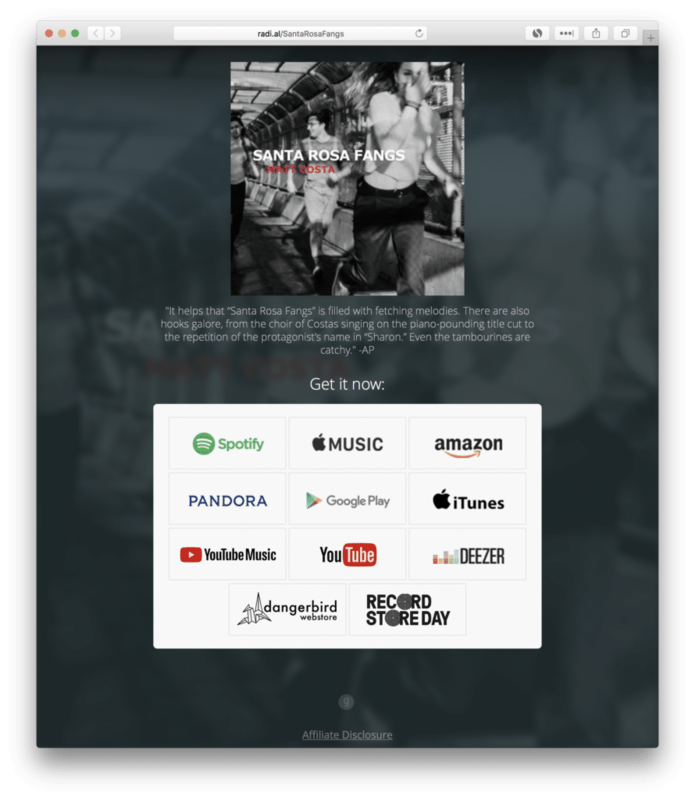 While Spotify, Apple Music / iTunes, Google Play, and Amazon are fairly common options for a music-focused Choice Page we also see client promoting the music videos on YouTube and a band’s merch on Bandcamp. Links to the band’s social media profiles or their label’s site are also fairly popular. While Amazon held the dominant position in selling books online, due to its deep roots of being an online bookstore, that dominance continues to ebb and flow, especially internationally. 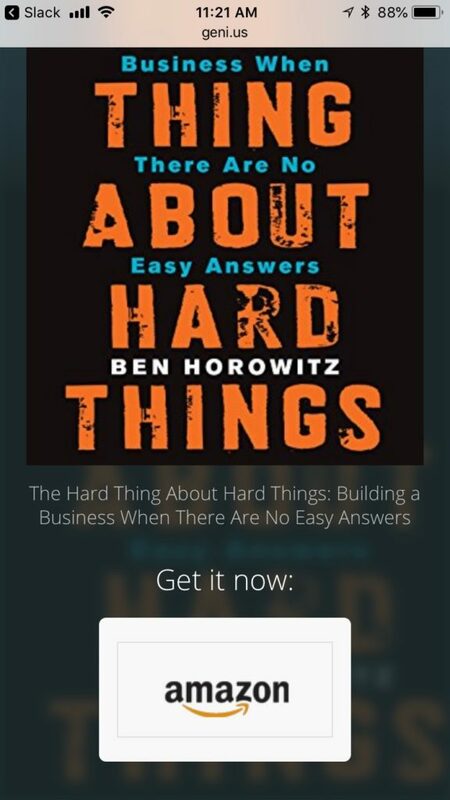 The proliferation of eBooks and reading on a digital device has also become a mainstay and the explosion of audio content in the form of podcasts and audiobooks has also put the traditional writing industry on notice but believe it or not, people still like to read the old fashioned way – with a paperback in hand. The various choices to readers, between retailer and book format, make marketing a bigger challenge than ever and have led to a growing wave of indie authors and marketers at publishing houses using Choice Pages to promote great stories. 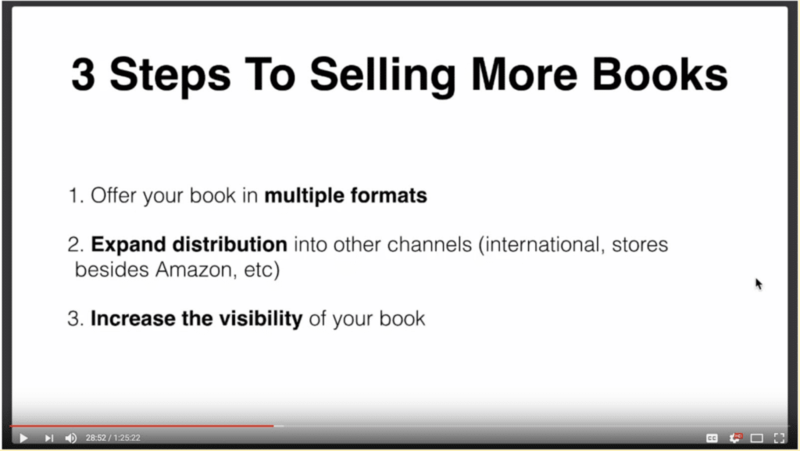 Further, providing your book in multiple formats and distributing on multiple channels are becoming best practices, just ask Chandler Bolt, CEO and founder of Self-Publishing School. Check out the Self-Publishing School Live Stream and jump forward to about 27:45. While Amazon.com, and it’s 13 international storefronts are a good start we also regularly see iBooks and Kobo as other great digital bookstores that support a worldwide audience. In the US, Barnes & Noble has a loyal audience both online, in physical retail and the Nook is still an alternative to Amazon’s Kindle. Major retailers like Target and Walmart as well as the more book focused Indie Bound and Books-A-Million are also popular book-buying destinations in North America. Adlibris, Thalia.de and Bol.com are great options for Europe and the list goes on with a clear favorite, or two, available for almost country around the world. The number of podcasts, and the platforms aggregating and publishing them, have exploded in the last decade. There are now a strong handful of big names in the podcast player market, including Apple Podcasts, Google Play, Spotify, Stitcher, Soundcloud, PlayerFM, iHeart, TuneIn and countless apps on the iOS App Store and Google Play’s App Store. The ease of distribution from the podcast publishing platforms makes us think that this list is going to continue rapidly expanding. With this growing list of ways to consume a podcast a Choice Page is a great tool to provide your wide and diverse community of listeners the opportunity for them to easily continue to consume your content within their favorite platform. Or send them back to your website and built in podcast player. As a brand, your primary focus is typically on building the best possible product and as a brand marketer your job is getting the word out about these awesome products. Shopping cart abandonment and credit card validation are issues you often leave to your channel partners like Amazon, Wal-mart and eBay. While you may have a favorite channel it’s likely not the only one your audience buys from your least favorite channel probably generates some sales too and likely also has some contractual agreement for some minimum of your marketing attention (which those details are probably part of the reason they aren’t your favorite). You’ve likely spent months bugging your in-house IT team to build out a simple solution on your website with a short list of retailers selling your product. You then likely end up using your marketing dollars driving traffic to your website. But unfortunately your conversion rate is likely total crap or you have no clue what they are because measuring the clicks you paid for and the sales made on the various marketplaces you directed to is pretty much impossible. It’s probably no surprise that a Choice Page, with minimum distractions to consumers, and the ability to leverage the various retailer’s affiliate programs to get insight into the black box they are, can help you with exactly these problems. You get complete control of the retailers listed on the Choice Page and can edit the list in near real-time to swap out partners as needed. You can clone your Choice Page to ensure each campaign has a unique set of metrics for easy reconciliation. You can ensure each link to the retailer is properly affiliated so that you can start to measure the sales your marketing drove without having to read tea leaves. You can always include a link back to your site for those that are more interested in learning while not distracting those more motivated shoppers that just want to buy. Quickly configure and customize a Choice Page then tweak it as your campaigns progress. You’ve heard it dozens of times that building a community is one of the most valuable things you can do as an online marketer and focusing on getting email addresses ensures that algorithm updates by the social media giants don’t jeopardize your reach. 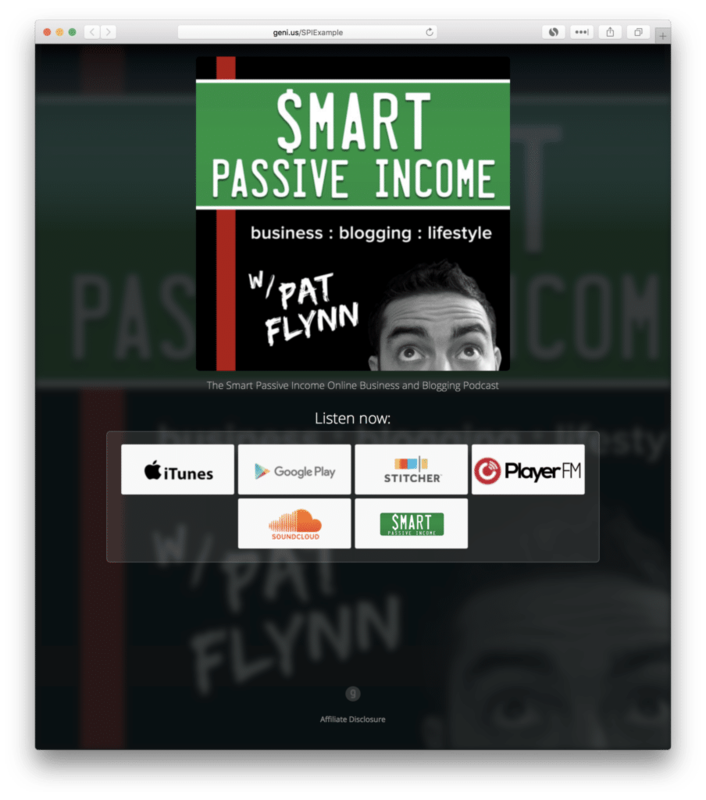 People like Tim Ferriss, Pat Flynn and Ryan Holiday have done an amazing job at this and one of the things that helped them realize the value of that work was the Amazon affiliate links they would include in those emails. Unfortunately, the Amazon affiliate operating agreement now includes a section that doesn’t allow direct affiliate links from “offline” mediums, such as emails (or PDFs). This means sending out an affiliate link in your email newsletter can get you removed from their affiliate program and lose out on any unpaid affiliate commissions. Bummer! 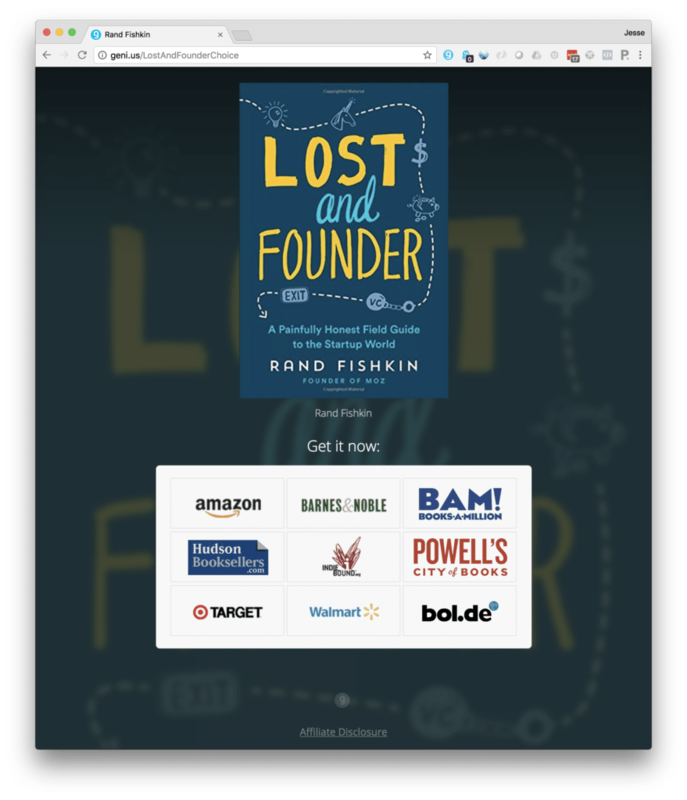 To play by Amazon’s rules marketers tried switching to sending clicks on their links to their website where they had to re-read similar content to find the buy button they initially thought they were clicking. Savvy affiliates are now placing a link to a Choice Page, even when it has just a single buy option, in their emails and this has helped marketers recover their conversion rates while being in full compliance of Amazon’s operating agreement. Win-win! Amazon’s affiliate program is an amazing place to start as it’s easy to use and, by the nature of Amazon, the conversion rates are relatively high as even when a consumer clicks to buy a free ebook but goes on to buy a new video game, you still get a commission. But that commission isn’t what it used to be and not everyone buys from Amazon. To optimize for these two issues, without risking the easy money that Amazon’s affiliate program is, affiliate marketers are adding a small handful of additional retailers that sell the same product they are recommending. 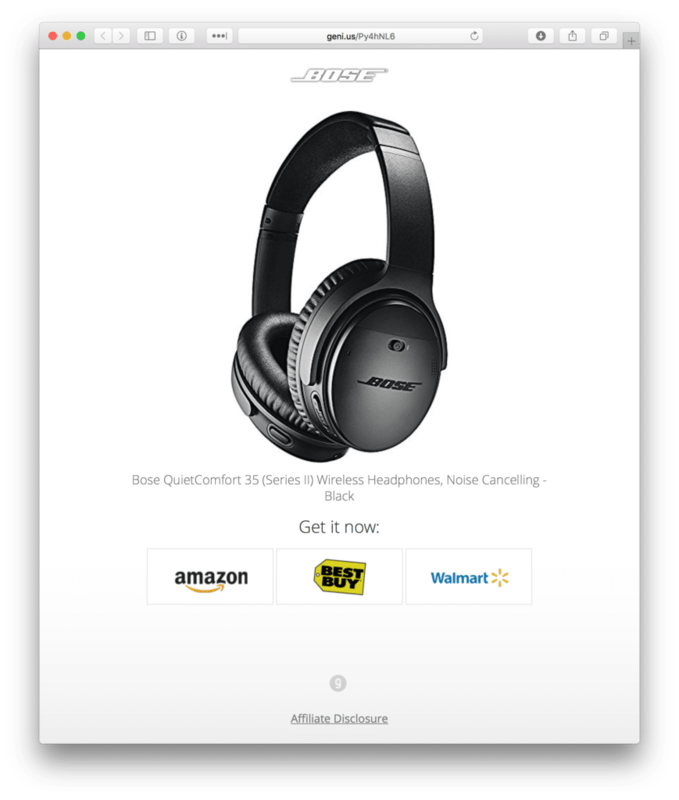 Unlike other options, where affiliates will swap out their Amazon link with another retailer’s affiliate link, or use an A/B Split Testing link to send a percentage of clicks to various retailers, the option to include multiple retailers on a Choice Page gives them all of the upside with none of the risk. Both Walmart and Best Buy offer affiliate programs with very competitive rates. Don’t let us stop you from getting creative with your Choice Pages, the sky is the limit! 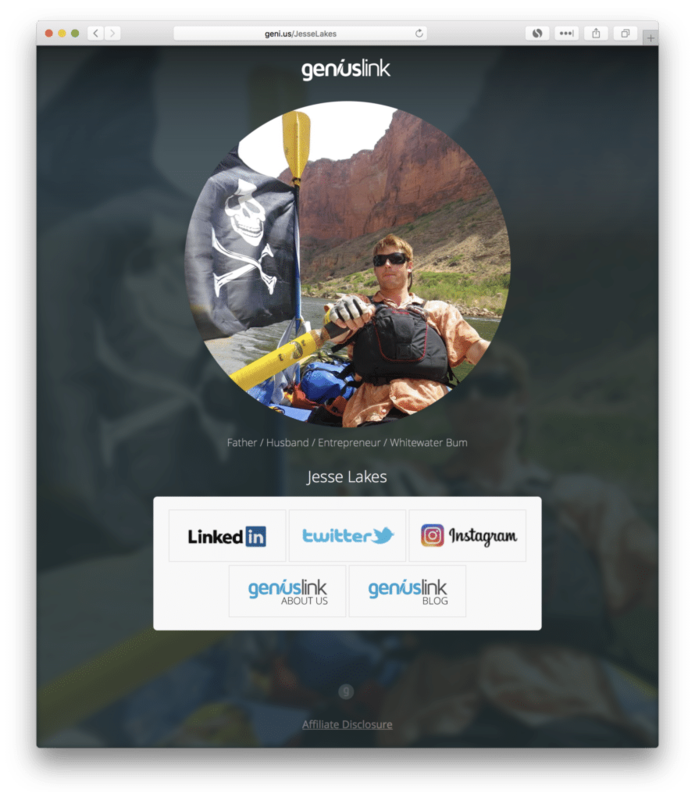 We were recently exploring the adoption of building a “personal” Choice Page and including each teammate’s social and professional online profiles along with a link to the posts they’ve written on our blog. What do you think? Another request we’re working on supporting includes bundling related products. For example, listing the components for the build out of a gaming rig or the popular lenses and equipment in a professionals photography set up inside a single Choice Page. Similarly, listing different customization options of a single product (eg. colors of a chair or upgrades for a stereo) is a great use case. Additionally, a Choice Page could also be listing the individual books (in a series) for authors or all of an artist’s albums. 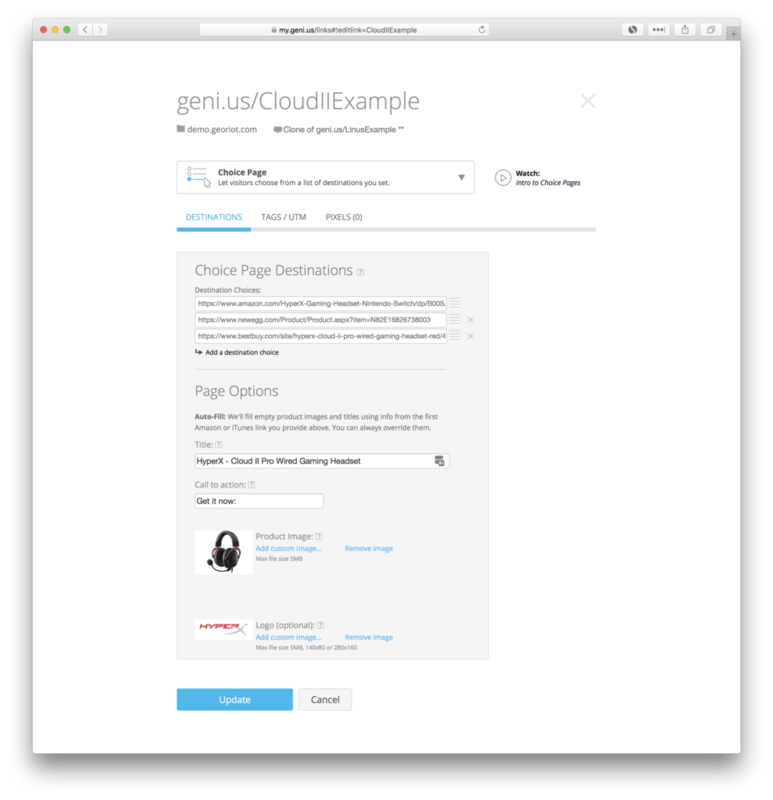 Have an idea on how you might use Choice Pages to improve the user experience, increase your conversions and revenue or reduce compliance issues? Let us know, we are eager make Choice Pages the perfect accompaniment to intelligent links and give you the tools to level up your marketing game.